What a charming quilt! A great size to snuggle under this winter! Would also work great as a wall hanging or toddler quilt. The applique and piecework are very precise. 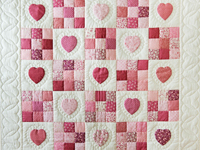 Nicely hand quilted with a great design around the hearts. Excellent fabric selections. A cozy quilt that feels like home! Well made by Lancaster County, PA young Mennonite quilt designer Connie Lapp and nicely quilted by a Mennonite friend. The back of the quilt is covered with an ivory colored fabric that has a tiny, subtle green print. What a charming quilt! A great size to snuggle under this winter! Would also work great as a wall hanging or toddler quilt. The applique and piecework are very precise. 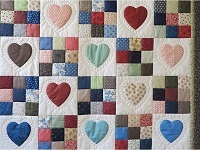 Nicely hand quilted with a great design around the hearts. Excellent fabric selections. A cozy quilt that feels like home! Well made by Lancaster County, PA young Mennonite quilt designer Connie Lapp and nicely quilted by a Mennonite friend. 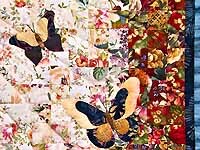 A fantastic pattern combination of patchwork and appliqué designed by C Jean Horst, Lancaster's renowned quilt designer. This background was hand arranged using 320 squares of 100% high quality cottons - light to dark prints laid up on a flannel board, then sewn together, one piece at a time. 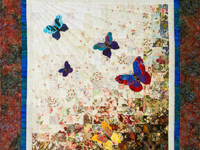 The butterflies were then hand appliquéd on the background. It is hand quilted by an Amish friend. The quilt is labeled on the back corner and has the documentation information recorded with the name of the patter, the Amish quilter's name, the 100% cotton label, C J Horst's name, as well as a note of the quilt being made in the USA. The backing of the quilt is a golden batik 100% cotton print with a sleeve for hanging. 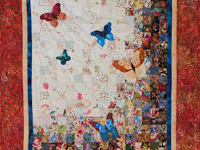 The quilting stitches are a beautiful 8 hand stitches per inch!!!. Magnificent piece of work. 100% cotton fabric on front and backing. 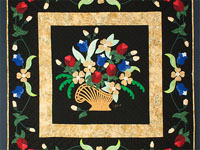 A fantastic pattern combination of patchwork and appliqué designed by C Jean Horst, Lancaster's renowned quilt designer. This background was hand arranged using 320 squares of 100% high quality cottons - light to dark prints laid up on a flannel board, then sewn together, one piece at a time. 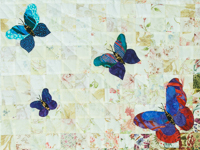 The butterflies were then hand appliquéd on the background. It is hand quilted by an Amish friend. The quilt is labeled on the back corner and has the documentation information recorded with the name of the patter, the Amish quilter's name, the 100% cotton label, C J Horst's name, as well as a note of the quilt being made in the USA. The backing of the quilt is a hand paint rust batik 100% cotton print with a sleeve for hanging. The quilting stitches are a beautiful 8 hand stitches per inch!!!. Magnificent piece of work. 100% cotton fabric on front and backing. How magnificent a piece of art !! The Bald Eagle was chosen in 1782 as the emblem of the United States of America because of its long life, great strength and majestic looks, and also because it was then believed to exist only on this continent. The Eagle appears in the Seals of many of our States, on most of our gold and silver coinage, and is used a great deal for decorative patriotic purposes. Here, C Jean Horst has this national symbol hand appliquéd on top of the pieced Lone Star - another of our country's famous emblems. 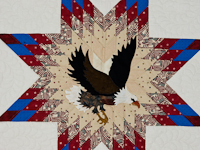 This is a well done combination wall quilt done in patriotic fabrics. Do NOT miss seeing the binding of this wall quilt which has USA, USA, USA repeated around the entire perimeter. What a priceless piece for our American homes today as a reminder of our freedom and strength. Magnificent! Sleeve for hanging. 8 hand quilted stitches per inch. A special quilt for a new baby or anyone! Beautiful rose colored fabrics on a cream background. 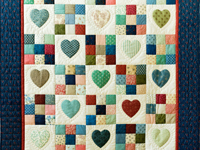 Lovely hand appliqued hearts outlined with a beautiful hand quilted design. Be sure to notice the very tiny hand quilted stitches. 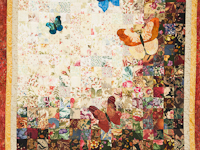 Made by Lancaster County, Pennsylvania Mennonite quilt designer, Connie Lapp. Hand quilted by a Mennonite friend. Fantastic! An original design by C Jean Horst. Wonderful fabric selections and outstanding applique work. Well quilted by local Amish woman. Copyright pattern -- directions not available.